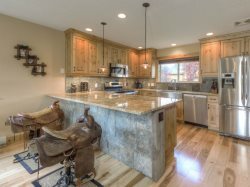 Luxury mountain lodge feel in the convenience of a chalet, Walk to Town Center, 7 mile drive to Big Sky Resort, Easy drive to Yellowstone Park. Exceptionally breathtaking spacious 2200 sq ft 3 bedroom, 3 bathroom and large loft chalet is loaded with high end finishes and beautifully decorated, a real designer’s touch. The chalet offers an open floor plan with several large windows to soak in the tranquil Big Sky scenery including wildlife who wander by regularly! This is the perfect starting and ending point for your mountain and Yellowstone Park adventures. Located 1 mile from the heart of Town Center where you want to be! A wide variety of great restaurants, shops, bakery, movie-theater, liquor store, groceries and free concerts in the park during the summer months. This gorgeous vacation rental is a 2200 sq. ft. multi-level chalet. Y'all were great suggesting properties that met the needs of 3 generations. Even when our first choice was sold after we booked it, you were fantastic helping us find a second property. Staff was so helpful and accommodating. Any issues were resolved immediately. We even asked last minute to stay and extra day and it was so smooth. Team members were great. Really appreciate email responsiveness, which made communications super easy. Great property for a large family or group with all necessary amenities. Convenient to the village. Very helpful, appreciated the call before hand to make sure we didnt have any questions. Wonderful getaway for our family and in laws. Comfortable, easy to book, access, and very well appointed. Best way to stay in Big Sky. They couldn't be nicer or more efficient. The team provided excellent customer service from the moment of inquiry to the day of our arrival. Maintenance team was exceptional at addressing our minor issue. This is a great three bedroom, three bath condo. There was plenty of room for seven of us to spread out. The dining area sat all of us and it provided a great place to relax after long hikes in Yellowstone. Little experience except by email. Excellent! Very friendly, helpful, and responsive! Everything was wonderful!!! Beautiful home, great location, fully equipped with necessary needs, great staff!